Our latest eCommerce website shop for Moon Creations has officially gone live! 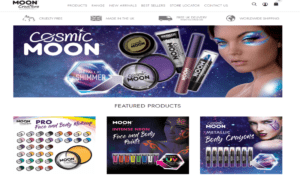 Market leader in Neon Cosmetics, based Moon Creations specialise in a wide range of UV makeup from Neon and Glitter Face/Body Paints, to UV Hair Gel and UV Lipgloss. With their HQ in Stevenage, Hertfordshire, we built and customised the new website for Moon Creations after they contacted us to re-design their existing website that required advanced features and functionality to promote and sell their extensive range of products. We look forward to building our working relationship with their design and web team to expand the website as the business continues to grow.